Indian curry, Thai noodles and fish tacos in the school lunchroom? Indian food, including roti wraps served with cashew slaw and cilantro mint raita, was on the menu recently at Kasson-Mantorville High School. 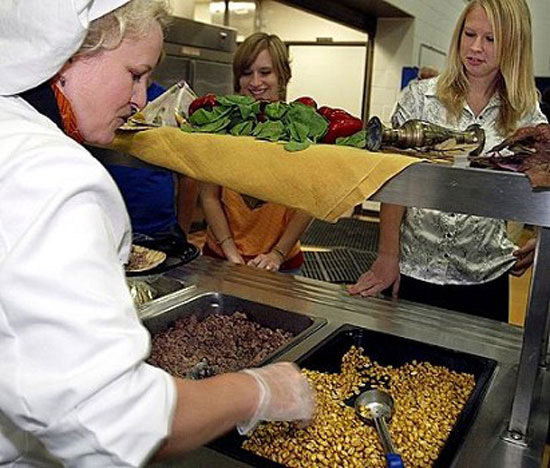 Regional Chef Shari Jarett of Rochester, left, serves Indian food to students, including junior Danyel Hythecker, right, recently at Kasson-Mantorville High School. 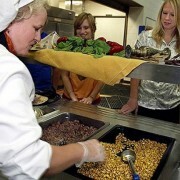 Regional Chef Shari Jarett of Rochester prepares Indian food, including spiced peanuts, recently at Kasson-Mantorville High School. Students at all levels are eating them and asking for more. In fact, they also are reaching for fresh vegetables, fruits and other healthy items. Not that pizza and corn dogs are off the menu — these are kids, after all — but a program that offers international-type dishes with an emphasis on healthy eating is making a difference. Behind the movement is Taher, a food service management company based in Minneapolis that counts RCTC, Plainview-Elgin-Millville, Triton, Kasson-Mantorville, Chatfield, Harmony and Preston among their school clients. Shari Jarett is the area’s traveling chef, going from school to school each week preparing and cooking a variety of specialties. Food service workers in the school also are involved. “Everybody is working side by side because we all believe these kids need to be exposed to different tastes,” Jarett says. So popular has the program become that Jarett is greeted by students who beg her to come back and cook for them soon. “I love that,” she says. Last week at Kasson-Mantorville High School, Jarett prepared an Indian dish made with ground turkey served with a yogurt spread flavored with cilantro and mint, all wrapped in a pita. The next day, she prepared a Mexican enchilada bake, also well received. The school lunch program is coupled with another Taher program called Food 4 Life. This is a commitment to offer items made from scratch as well as snacks that incorporate natural products with no artificial ingredients or preservatives, Jarett says. It also promotes locally grown fruits and produce and publishes informational flyers promoting a healthy food lifestyle. In the guidelines, Taher emphasizes that if a recipe calls for fresh beans, the cooks need to use fresh, not canned or frozen. It also stresses that bread is to be served only when menued and/or with salads if offered as a second entree. “Kids love their bread, and we are cutting back on that,” Jarett says. Taher also offers training sessions led by their chef staff to better acquaint the school workers with what is available. Jarett works alongside the kitchen staff as well. Jarett asks for menu suggestions from students.